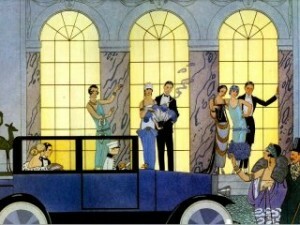 The Great Gatsby portrays the life of thriving generation of 1920s America in high splendor and endless glittering parties. Nick Carraway, the narrator, was a bond man who recently moved to New York and resides in the West Egg district of Long Island, and was neighbor to one young rich man named Jay Gatsby. The story starts when Nick went to East Egg district one night to dine with his cousin, Daisy, and her husband Tom Buchanan. From another girl who was present at the dinner, Jordan Baker, Nick learned about the turbulent marriage of Tom and Daisy and that Tom has a mistress. Myrtle Wilson, Tom’s mistress, lived in the valley of ashes, a gray industrial dumping ground between West Egg and New York City. Nick’s curiosity and fascination about his mysterious neighbor was answered when Gatsby eventually invited Nick to one of his parties. There Nick would learn that Gatsby and Daisy were once sweethearts. A reunion was set between Gatsby and Daisy in Nick’s house, where the two young lovebirds rekindled their romantic relationship. Their affair would soon raise suspicion from Tom, who would not have his wife cheating on him while he was involved in an extramarital affair himself. The confrontation between Tom and Gatsby reached its peak when Tom let Gatsby drove his wife back home to East Egg in his luxurious car, and then an unwanted accident happened. In the aftermath, the corruption, moral decay, carelessness, hypocrisy, and superficiality of the people surrounding him; all came crystal clear before Nick’s eyes. The novel took place when the First World War had just ended and America has never been more prosperous, a time called “The Jazz Age”, which later ends in the Great Depression. The problem with these rich people in this time was; they became so consummated in their wealth that they grew careless, superficial and pleasure-seeking. Not one, I repeat, not one of the characters in this novel is likeable to me. Tom Buchanan was a bad-mannered libertine and his wife Daisy a shallow, foolish girl. The cynical Jordan Baker had enough nerve to drive carelessly and taking other people’s safety for granted. Meyer Wolfsheim, the Jewish man who wore human molars as cuff buttons, was cowardly and deceiving. Even Gatsby, he isn’t so “great” as in the title of the novel. Yes, he is “great” in his optimistic spirit to pursue his dream, which is winning Daisy back, but to be able to win Daisy he would have to climb to her social status, and to do that he need to make a fortune in dishonest, fraudulent ways. The only “clean” character was Nick Carraway, who stayed on Gatsby’s side to the very end, when not another soul would come into the marred picture. This book is probably the most difficult book that I have read that only has less than 150 pages. The narrative was written beautifully—yet I felt the great need to read many passages more than twice, check dictionary and even consult the Internet to attempt to fully comprehend what Fitzgerald was trying to say. And even in the end, I can’t say that I can now fully comprehend The Great Gatsby. But at least, thanks to Sparknotes and Fanda’s chapter posts, I came to understand some confusing passages and symbols depicted in the novel. In spite of entertaining, this novel would make you think hard. Finally, I think The Great Gatsby is great because it bravely shows the ugly truth of man, and in the end still encourages optimism in the powerful words of the last passage of the novel. For the finest novel by The Great Fitzgerald, I gave three stars. Still, this book is very interesting, right? I think in the end Fitzgerald wanted to say about the American Dream, which did not appear to be as great as it had first been dreamed, because people were abandoning God and morality to chase money and pleasure. I think Fitzgerald is a genius author, who can craft so many metaphors and philosophy into a beautiful prose. Now I’m anxious to read Tender is the Night (I heard it’s his most autobiographical novel). i agree with you Fanda, the new era after the First World War create a new dream to American people and everybody tries to pursuit it and i think Fitzgerald gives us a great illustration about it…the difference perception between old money and new money..how they act..but Fitzgerald emphasizes the new money style really great (orang kaya baru yang kaget gitu). i haven’t been able to post the review today, actually i haven’t finished reading this book (already chapter 9). I will try to finish this book today, so i can post the review tomorrow. actually, thank God we see Great Gatsby through nick’s point of view, at least i have an objective and clean observation about Gatsby, Tom, Daisy and other characters in this book. the metaphor..gosshhhh i can’t stand it mel..really difficult to understand…and same as you this is the most difficult book i have ever read. I agree with you Esi, I can’t imagine The Great Gatsby being narrated by anyone else but Nick Carraway! Good to know that I’m not the only one who gets confused by this book, hehehe. This is one of those books that had to grown on me. I really didn’t like it the first time I read it. I liked it the second time, and I fell head-over-heels in lvoe with it the third time. “And even in the end, I can’t say that I can now fully comprehend The Great Gatsby.” <– I think that's true for everyone! Great thoughts! It’s difficult, but worth to read. In the end it made me see my dreams in a totally different light. Just like you, ,aybe the next time I read it I will like it more! I am now reading cuckoo’s nest (which I borrowed from you), and it’s as difficult as Gatsby to me, hahaha, sans the romance. Anyway I enjoyed the ride… and I agree this is an exceptional book! Reblogged this on Baca Klasik. Submit your e-mail address below to have notifications on new updates in this blog. ♥ : Gotta be honest. I hate it! ♥ ♥ ♥ : Well, I like it! ♥ ♥ ♥ ♥ : I really like it! Gotta read it again some other time. ♥ ♥ ♥ ♥ ♥ : Speechless. Out of words. That’s how AMAZING this book is!